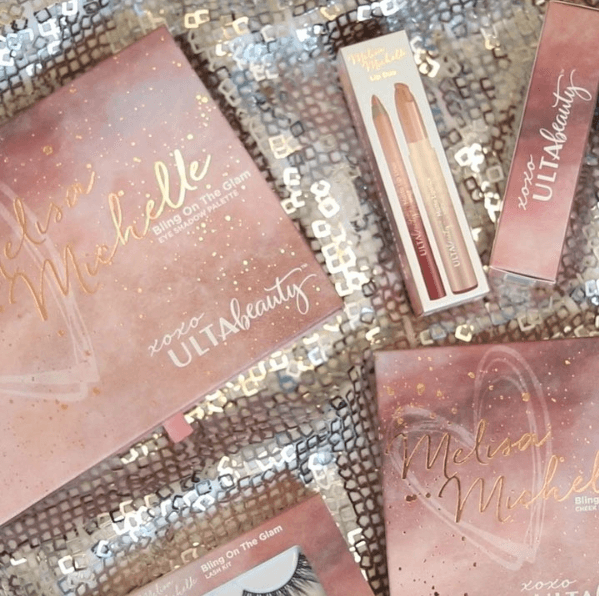 Ulta Beauty is launching a ROUND 2 collab, Bling On The Glam with Melisa Michelle on Thursday, 7.05 online and in stores the week of July 22nd! In case you didn’t know, this time last year they released their first collab and now we’ve got a full collection! 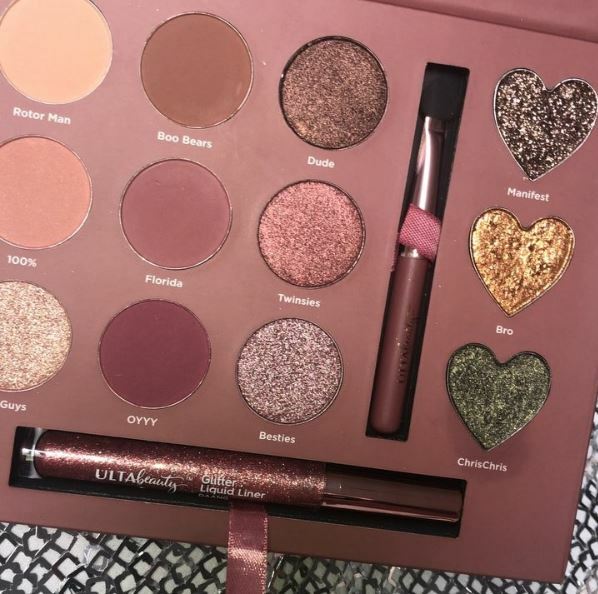 The full collection includes an Eyeshadow Palette ($20), Cheek Palette ($16) with two highlighters, Lip Duos ($12.50 each) with a lip liner and satin matte lipstick and finally a set of Lashes ($7). You know we LOVE collabs (especially YouTube collabs) so we are sooooooo excited for this launch! How exciting for Michele to get the opportunity to work with Ulta again! And a whole collection this time?! Yes! We have to admit, though – we were pretty disappointed with her last palette. We actually have a YouTube video reviewing it up on MakeupFOMO’s channel (you should subscribe if you haven’t yet! Join the FOMOfam!). I actually ended up returning it just because I was so disappointed in the selection and the formula and how everything performed. But I think I’m willing to give this another chance! I like Melisa alot (tbh, I liked her more before she got super huge, I’ve been watching her since she was married the first time around and filming in her closet!) and obv I love Ulta so I want to show support! The thing I really don’t like that they replicated in this collection is that there is the slot for the brush and liner IN the palette. Why?? 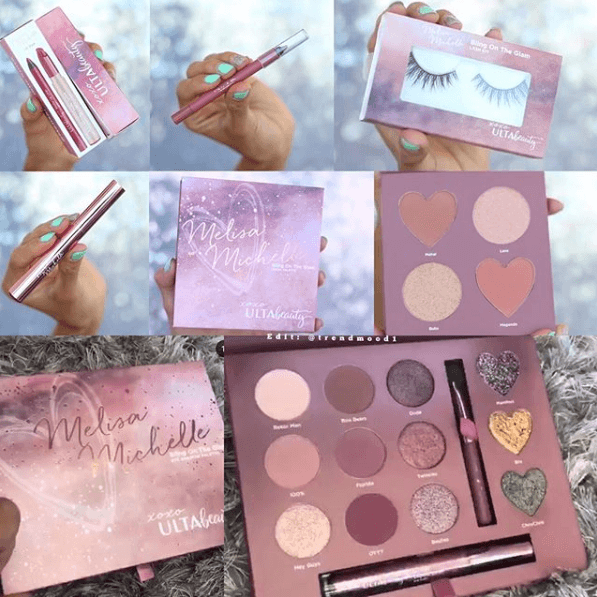 I hate when brands do that – once you take those out, it’s just awkwardly empty and your palette has these like random holes in it and there’s just something about that design in a palette that cheapens it for me. But then again, it IS a pretty cheap palette so I suppose we can’t complain much. As for the other items in the collection? I’m not too interested, so I’ll pass on those but I may scope them out at the Ulta display!